Barbara Mueller has more than 30 years of experience directing real estate deals of all types. Ms. Mueller represents lenders and borrowers on construction and permanent loans and negotiates sales, purchases, tax-free exchanges, and leases of properties ranging from raw land to office buildings, apartment complexes, resorts, and warehouses. Ms. Mueller has significant experience working with health care providers in developing medical center campuses and specialized medical office buildings. She also represents a number of energy providers and lenders developing major wind and solar projects and gas-fired electric generation facilities. 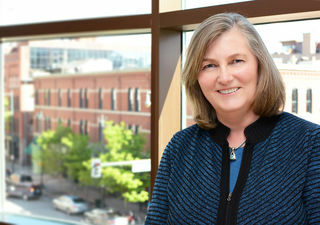 Ms. Mueller has represented health care providers in connection with development agreements, ground leases, restrictive covenants, physician leases, financing, and land use issues for the development of new medical office buildings in Aurora, Denver, Lone Tree, and Colorado Springs, Colorado. She is the primary real estate counsel for HCA-HealthONE LLC of Denver. Additionally, Ms. Mueller also has extensive experience advising clients developing renewable energy. She has represented clients building wind farms on matters relating to land access, easements, conditional use permits, transmission line issues, and financing. She has also acquired property, resolved government land use permitting issues, negotiated easements, including conservation easements, and worked on financing and construction issues for both simple and combined cycle electrical power generation plants in several locations along Colorado’s Front Range.